Turn the page, journey back in time! It’s Christmas Eve, the adults are talking among themselves and the children are bored…until Mum presents a Christmas box from the attic. In it there are snap cards, a jigsaw of a snowy festive scene and most extraordinary of all, a storybook with magical properties. 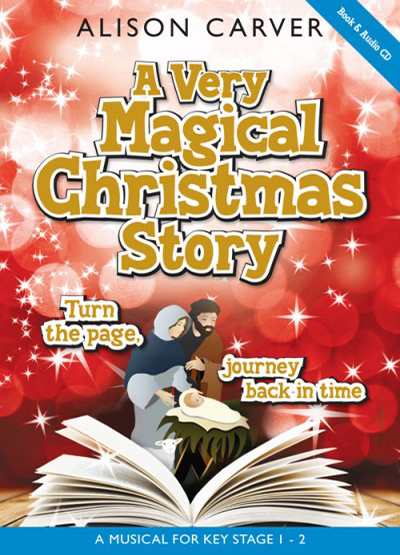 At the turn of a page, the children are transported back in time to discover the true meaning of Christmas finding themselves under a table in Mary’s kitchen in Nazareth. Then it’s on to Bethlehem at the turn of another page, to a hillside where shepherds reside, and to the house of the Wise Men, before all gather together at the scene of the Nativity. But that’s not the end, it’s only the start of the greatest story ever told. Props and costumes are listed by character and scene in the script.